Some artists spend a lot of time researching their materials and plotting how to tackle a project. Others prefer spontaneity. Some like to carefully consider each stroke of the brush. Others prefer to see what happens on the spur of the moment. Two recent productions examined how art is created through diametrically opposed techniques. In each case, the artist being showcased is of Spanish birth and international renown. In one production, research for a new project takes the kind of clinical approach one might expect to encounter in a medical laboratory. In the other, art evolves quickly and in bold colors. 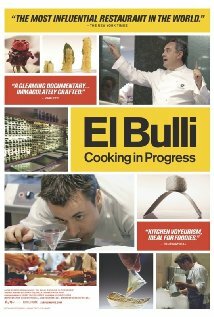 Prior to July 30, 2011, when El Bulli closed its doors with plans to reopen in 2014 as a culinary think tank and center of creativity, the restaurant was famous around the world for its imaginative menu and its experimentation with molecular gastronomy. It was also a notoriously difficult place to get a reservation. In 1984, Ferran Adria joined El Bulli's kitchen staff. Three years later he was given complete command over its kitchen. In 1997, after El Bulli earned three stars from the Michelin Guide, its fame spread far and wide. El Bulli's bucolic setting near the town of Roses on the Costa Brava (approximately two hours from Barcelona) has an elegant simplicity. Although each season brought nearly two million requests for its 8,000 dining slots, the restaurant's business model was hit hard by the global economic crisis (during each evening's four-hour meal, 50 guests feasted on a tasting menu of more than 30 dishes prepared by at least 40 chefs). "His book is a shockingly beautiful catalogue of his latest accomplishments... Pastry chefs everywhere -- when they see this -- will gape in fear, and awe, and wonder. I feel for them, like Eric Clapton seeing Jimi Hendrix for the first time, one imagines they will ask themselves 'What do I do now?'" Watching Adria in his workshop in Barcelona, however, reveals an inquisitive artist who uses a scientific method as he tries to create radically new dishes. His goal is simple: "After four hours, when you're almost at the end of the menu, the more bewilderment, the better!" Years ago, Ferren Adria started a tradition of developmental sabbaticals during which he and his closest colleagues could work on their menu for the restaurant's upcoming season. During this time they would test new ideas, see which culinary process brought out the best flavor in specific ingredients, and meticulously enter their findings into a database. While Adria and his heavily male staff give microscopic attention to the ingredients and presentation of each dish (his chefs are equally adept with laptops and digital cameras as they are with a stove), the secret is to watch Ferran's eyes as he observes what's taking place around him and, most particularly, as he tastes something. The greatest crisis Adria faces during this documentary has nothing to do with food spoilage, bad weather, or unruly guests. The look on Ferran's face when he learns that a hard drive has crashed speaks volumes. "I appreciate food, but what I really wanted to do with the film is look at what happens from the idea to the plate. Our approach was really to concentrate on the creative process. There is an intensity to the work ethic at El Bulli that I like very much. The menus and dishes are protagonists. There's a lot of pressure to invent something. We wanted to portray in the film the fact that ideas don't fall from the sky. Creativity is hard work." There's no doubt that Herbert Siguenza knows his way around a stage. A founding member of Culture Clash who has co-written and performed in numerous shows over the past quarter century, Siguenza teaches and directs at UC Irvine. The fact that Siguenza graduated from the California College of Arts in Oakland with a Master of Fine Arts degree in printmaking would seem to make him the perfect choice to portray a great artist onstage. 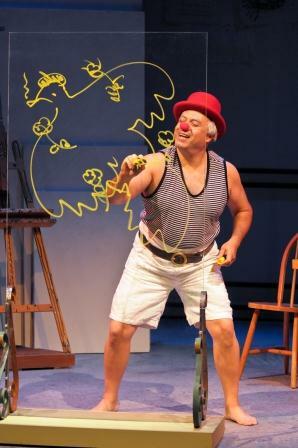 And yet, there is something strange about his one-man show, A Weekend With Pablo Picasso, that left me surprisingly unimpressed after attending a performance out at Center Rep in Walnut Creek. In 1957, while enjoying a peaceful Friday afternoon in his studio in the south of France, Picasso receives a phone call from his agent informing the artist that a wealthy American wants him to paint six canvases and three vases by Monday morning. "Who does he think I am, Dali?" asks the artist. Siguenza lets the audience take on the role of strangers who have arrived (uninvited) at Picasso's studio to watch him work. At certain moments during the show, the onlookers become an approving chorus. 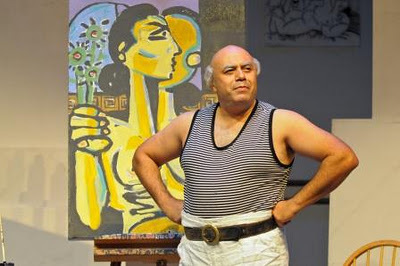 At other times, Picasso interacts with the people he sees in the audience. This article was cross-posted on My Cultural Landscape. To continue reading, click here.